Houston Community Resilience Exercise (CREX): Community engagement with federal, state, local law enforcement, civic, community, and inter-faith partners. Photo provided by the Harris County Sheriff’s Office. The Boston Marathon bombings, the failed truck bombing at the Mid-Continent Airport in Wichita, Kansas, and a litany of other failed or thwarted terrorist attacks on the United States all underscore a serious problem with violent extremism.1 It is not just a local, federal, or, even, a monetary problem. It is everyone’s problem. FBI Director James B. Comey offered insight. Law enforcement and federal government officials know how pervasive this problem is, and they have developed strategies to stop more disenfranchised Americans from transitioning from radical thinkers to radical extremists. The idea is to reach people before they cross that line. One of the key strategies for countering violent extremism (CVE) is to reach out to communities to build trust and rapport to stem the tide of violence. Every local police department strives to engage communities and develop working relationships with citizens. Yet, when these communities have citizen groups consisting largely of immigrants—with a different language, culture, and sometimes a distrust of law enforcement—there are additional challenges when building a positive relationship. Terrorism organizations often target this group of Somalis to encourage their young men to become foreign fighters. Therefore, breaking down barriers and promoting open communication between the community and police are critical. This chipping away at barriers and building trust is challenging work that requires open dialogue and a willingness to cooperate. It also will not happen overnight. Over the past decade in St. Paul, the police department has gone from having no relationship with the local Somali community to a robust one that has garnered international accolades. The agency has created several community outreach initiatives to promote communication. St. Paul police officials have worked closely with the FBI’s Minneapolis Field Office in community outreach efforts.8 The FBI had to overcome some erroneous perceptions before laying the groundwork for reaching out and building trust. Community outreach in the area has achieved tangible results. Because of the relationships built with the community, local law enforcement agencies and the FBI have prevented several local young men from traveling overseas to fight for or with terrorist organizations. The efforts of the CVE/ICG have been lauded not only in Los Angeles but also across the nation as being a model of collaborative efforts in addressing community engagement and implementing proactive CVE measures. The group recognizes that CVE and addressing radicalization are not problems law enforcement can address through arrests alone. Instead, to counter this trend, the city of Los Angeles is positioning itself to address at-risk individuals and communities. The CVE/ICG participates in numerous community events to build trust and rapport with local leaders, which aids their collective outreach efforts. The FBI’s CVEO, along with its federal counterparts, is leveraging its resources to empower local partners to prevent violent extremists and their supporters from inspiring, radicalizing, financing, or recruiting individuals or groups in the United States to commit acts of violence. That shared mission must penetrate four layers deep and reach not only leaders with influence but also their communities. In all CVE efforts, partnerships and collaborations are critical. No single entity controls CVE, but each has an interest in preventing violent extremism. The White House’ strategic approach to CVE encompasses this conclusion. In 2011 the White House disseminated its national strategy “Empowering Local Partners to Prevent Violent Extremism in the United States” and the corresponding Strategic Implementation Plan (SIP).14 This strategy outlines the federal government’s role in empowering American communities and their local partners to counter violent extremism. This mandate enhances information sharing, facilitates a greater understanding of the threat from radicalization, strengthens law enforcement cooperation and expertise, and assists communities in building resilience against extremist propaganda. The SIP provides a blueprint on a whole-of-government approach to address these issues and focuses on three priority areas: 1) enhancing and expanding engagement; 2) building CVE expertise; and 3) countering violent extremist propaganda. The White House National Security Council (NSC) staff continues to drive the CVE program’s advancement.15 One change has been the alignment of NSC efforts and its interagency policy committee with the FBI, U.S. Department of Justice, National Counterterrorism Center, and DHS.16 These agencies form the Group of Four (G4) and help carry out and advance the NSC’s CVE mission. Three Cities Model: NSC advocates a comprehensive approach to CVE, which aligns lines of effort with existing resources in a three-pronged approach: mapping out department and agency programs, establishing measurable goals, and formulating assessments on desired outcomes. The three cities selected to participate in the city model development are Boston, Minneapolis, and Los Angeles. Community-Led CVE Models: NSC assesses local and community CVE prevention and intervention models for possible applicability nationwide. Research: The SIP calls for analysis in five broad areas, including the Internet, homegrown violent extremism, disengagement, non-al-Qaida extremism, and preoperational indicators. A working group is identifying pertinent research for dissemination to the interagency partners and local communities, promoting intelligence transparency. Disengagement: The working group is researching innovative ways to apply resources to target at-risk individuals before mobilization to violence, including law enforcement responses other than disruptions. For more than 15 years FBI behavioral and counterterrorism experts have studied what leads individuals down the path to radicalization. The FBI and its federal partners have an opportunity to provide a roadmap for the U.S. Intelligence Community; state, local, and tribal law enforcement partners; and community leaders to help prevent radicalization. The CVEO draws from a variety of behavioral models to identify individuals susceptible to radicalization and to thwart efforts before those persons mobilize. Behavioral experts hypothesize that violent extremism possesses similarities to other modes of social behavior and developmental models. Most notably, violent extremism is not a linear progression, but an evolving, dynamic situation involving numerous factors, catalysts, inhibitors, and mobilization variables. To illustrate, the Pyramid Model on activism and radicalization contends that once an individual experiences changes in feelings, beliefs, or actions, the need for activism becomes the primary motivator, manifesting in increased levels of radicalization.17 Other behavior models parallel societal behavioral patterns. Social Identity Theory: An individual’s self-image and status are directly connected to the group they belong to, resulting in social categorization. A sense of belonging becomes an important factor in pride and self-esteem. The central theme is that group members seek to find negative aspects of other groups, which enhances their self-image, but also might result in prejudice, hatred, and violence toward other groups. Gang Model of Criminal Behavior: A gang member feels deindividualized and willing to commit violent acts consistent with the gang’s behavior and feels less personal responsibility. This separation from self results in less accountability and self-awareness and manifests in instances of deviant behavior. Causation Model of Juvenile Delinquency: A child is vulnerable to detrimental influences from familial, socioeconomic, educational, or ideological factors, resulting in criminal deviant behavior. The child is subjected to dysfunctional behavioral norms, rather than supportive or nurturing norms, resulting in delinquent behavior. Once exposed to dysfunctional norms, the child begins to exhibit behavior contrary to social expectations. Risk Model: An individual becomes at-risk when three elements are present: threat, vulnerability, and consequence. These three elements are not independent of each other, but, rather, all must be present to result in an at-risk individual. The sum of these three elements equates to an individual’s risk, which considers motivation, intent, capability, opportunity, and psychological gain from acting on intentions. The FBI works with its interagency partners, academia, and other countries who have collectively conducted social science research to better understand the catalysts driving violent behavior. The dilemma in this evaluation process is to identify when an individual passes from thought to action, which involves an escalation of behavior toward radicalization. Once radicalized, some individuals act upon their thoughts and become mobilized. The FBI and its partners must either recognize when an individual exhibits radicalized behavior or take preemptive action during mobilization and subsequent execution of their intended plans. Intervention along this behavioral continuum is referred to as “left of boom,” illustrating that countering extremist views can take place at any time during the behavioral progression leading up to a violent act. Intervention might take many forms, including risk mitigation and conflict resolution, disengagement, deradicalization, or disruption, including arrest. An act of violent extremism, or “right of boom,” often is met with a reflexive response involving investigation, increased security measures, or, possibly, military action. This also must include a reflective, intelligence-gathering response, which assesses the underlying causes and motivations behind the violent act.18 Because the FBI is both an intelligence and law enforcement agency, it is well positioned to assess extremists and their world, as well as to employ its law enforcement authorities to address the threat with a reflexive response as warranted. Understanding the underlying reasons for radicalization is another tool in the CVE toolbox. The FBI works with its G4 partners on the Community Resilience Exercise (CREX). This exercise promotes community awareness through an understanding of the catalysts to extremism and formulates ways communities and law enforcement agencies can identify and respond to radicalized behaviors. Each CREX results in a community action plan, collaborating with local partners and federal agencies. Beyond CREX and the Three Cities Model, the CVEO supports and guides field offices in implementing local CVE initiatives. The CVEO crafted a concrete FBI CVE Model, which can be tailored to the individual areas of responsibility for each of the 56 field offices. The model allows CVE field managers to compare information about activities and performance and to share best practices across the field while providing each field office with a comprehensive CVE program that documents its efforts and accomplishments and highlights community successes. The FBI CVE Model represents a customized CVE program based on each field office’s threat profile and helps local FBI offices establish relationships within their communities, share pertinent intelligence, and, ultimately, make communities safer by mitigating emerging threats. The FBI CVE Model aids in the prevention of violence and provides communities with tools to build resilience against the catalysts to extremism. It educates and builds awareness within communities; develops an internal FBI CVE Community of Interest; leverages FBI subject matter experts, existing resources, and initiatives; and expands preexisting protocols and relationships. The CVEO is working cross-programmatically to build a CVE Community of Interest by drawing on the expertise, successes, and lessons learned from the various FBI programs that touch elements of CVE. For example, the Behavior Analysis, Safe Streets and Gangs, Violent Crimes, and Active Shooter Programs all lend best practices to the CVE mission. Some of those best practices have a particular nexus with countering violence at the local law enforcement level, so developing strategies from that perspective is critical to CVE success. Although not a primary focus of the FBI CVE Model, the CVEO will elicit input from the FBI’s 64 legal attaché offices on CVE programs outside the continental United States. In doing so, the CVEO can uncover best practices and build relationships with foreign counterparts. The CVEO is collaborating with foreign governments and international law enforcement partners in sharing best practices and initiating CVE exchanges. In recent months, Legats London, Madrid, and Nairobi conducted CVE exchanges with foreign counterparts. International Operations Division (IOD) also coordinated CVEO briefings with delegations from Canada, the United Kingdom, Singapore, and Australia. Also in the CVEO toolbox is the Law Enforcement Enterprise Portal (LEEP) Special Interest Group (SIG). This is an online group that houses resources and information, including various CVE models, radicalization indicators, information on targeted violence, engagement strategies, research, CVEO Bulletins, and G4 activities. The SIG provides direct connectivity to international, federal, state, local, and tribal law enforcement agencies and will evolve into a clearinghouse of pertinent CVE-related materials that can be used in any community. It also will provide insight into FBI CVE efforts and ways the FBI has advanced its program to support and empower local law enforcement organizations. The restricted SIG is limited to law enforcement personnel and CVE practitioners and can be accessed via the LEEP Internet portal. Local law enforcement agencies and their communities are in the best position to find out whether vulnerable people are radicalizing. Law enforcement officers’ involvement in those communities and the trust they build could spur a local faith leader or community leader to identify a young man who plans to travel overseas or plant a bomb. The FBI and its federal partners can support and inform, but until certain legal lines are crossed, there are limits to the actions they can take. The key to countering violent extremism is to steer would-be attackers down a positive, productive path before they cross over from radical thinker to radical extremist. To accomplish CVE success, there must be cooperation between law enforcement from all levels and an ongoing dialogue with communities that stands on a firm foundation of trust. That type of success is gaining powerful momentum in places like Minneapolis and Los Angeles and with the right tools, leadership, and commitment, in communities elsewhere. Why was CVE so important to your mission in Minneapolis? Minneapolis is a very diverse community. Minnesota has the largest population of Somalis in the United States, most of whom reside in the Twin Cities area. The area is also home to the second largest population of Hmong in the United States. As special agent in charge, I felt like it was my job to reach out to these communities—in particular, the Somalis—because they are an at-risk community. Since 2006 we have had a significant number of Somali youth travel to Somalia to fight for al-Shabaab. The result was one of the longest and most extensive terrorism investigations since 9/11. There are a lot of misconceptions out there about the FBI. It was part of my job to help people understand the FBI investigates violations of the law. We’re not targeting any particular group. I attended many community events and met regularly with Somali leaders. I spoke at Somali Independence Day, which is a big event in Minneapolis. I held a town hall meeting with the community and answered many questions. I worked closely with a group called Kajoog, a group of young people working to engage in the community and counter violent extremism. Because I had limited resources for community outreach, I worked closely with other federal, state, and local law enforcement agencies and community partners to help them help the communities they serve. One way we engaged the community in the Twin Cities was through the FBI Academy Citizens Academy Program. An at-risk community leader can go through the Citizens Academy, learn about the FBI, and message back to their community what the FBI mission is all about and dispel many misperceptions about the FBI. What was the reaction from the communities you engaged with? At first, there was a fair amount of skepticism and suspicion. When I spoke at Somali Independence Day, there were thousands of Somalis there. It was a big festival with all sorts of music, dancers, and entertainment. I went on after the Somali comedians, a tough act to follow. When I went up to speak, there was a mixed reaction—a few boos, some applause. I was a little nervous, but I spoke from the heart and talked about the FBI and what we are about. I said we are trying to help the community. When I left the stage, there was more applause than boos. I think the key is you have to be genuine, and the community needs to know you are committed for the long term. I think when you do a prepared statement, sometimes the audience knows you might not be speaking from the heart. This approach worked out well for me. What role did state and local law enforcement play? You have to let the community know that you are part of a team. The FBI is part of that team, along with local police chiefs and sheriffs. The local police departments would invite us to their community outreach events. You are all interested in one thing, and that is preventing people from becoming radicalized. One of my best partners was the chief of the St. Paul Police Department. He was tireless in community outreach efforts. One of the challenges we face in working with at-risk communities is they have bigger challenges that we can’t affect too much, like lack of economic opportunities and jobs. Somali community members would often ask me, “Are there Somali FBI agents?” “Does the FBI hire Somalis?” Of course, we do hire Somalis, including Somali translators, but that is on a very small scale. Jobs are a huge issue in at-risk communities because everyone wants to achieve the American dream. But we are very limited in what we can do. What steps did you take to make the program sustainable after you left Minneapolis? That is a big challenge. SACs come and go. You have to have a committed group of folks in the office who want to do community outreach. In Minneapolis, I was lucky to have a community outreach specialist and other professional employees who enjoyed doing this type of work. As an SAC, I would give them flexible hours in order to engage in community outreach, much of which took place after regular work hours. If you want to have a sustainable community outreach program, you have to have committed people who continue this great work after an SAC leaves so there is continuity. 1 On April 15, 2013, accused bombers Tamerlan and Dzhokar Tsarnaev detonated two pressure-cooker improvised explosive devices (IEDs) on Boylston Street near the finish line of the Boston Marathon. On December 13, 2013, Terry Lee Loewen, a radicalized U.S. citizen with documented allegiances to al Qaeda in the Arabian Peninsula, was arrested and charged with multiple terrorism-related counts after attempting to detonate a vehicle-borne IED on the tarmac of the Mid-Continent Airport in Wichita, Kansas. His trial is pending. The incident marked the 61st thwarted terrorist attack against the United States since September 11, 2001. 2 Statement of FBI Director James B. Comey before the U.S. House of Representatives Committee on the Judiciary, June 11, 2014. The shootings at the Overland Park, Kansas, Jewish Community and Retirement Centers occurred on April 13, 2014, allegedly by white supremacist extremist Frazier Glen Miller, Jr.
3 Minneapolis: City by Nature, “Diverse Minneapolis,” http://www.minneapolis.org/visitor/diverse-minneapolis (accessed August 11, 2014). 4 St. Paul Police Chief Tom Smith, "Saint Paul, Minnesota: The most livable city in America," http://www.stpaul.gov/index.aspx?NID=1805 (accessed August 11, 2014). 5 St. Paul Police Foundation, http://www.saintpaulpolicefoundation.com/programs/ (accessed August 11, 2014). 6 Food permissible under Islamic law. 7 St. Paul Police Chief Tom Smith. 8 Federal Bureau of Investigation, Minneapolis Division, http://www.fbi.gov/minneapolis/ minneapolis (accessed August 11, 2014). 9 Former Minneapolis Special Agent in Charge J. Chris Warrener, now deputy assistant director of the FBI’s Criminal Investigative Division. 11 To better address this evolving threat, the FBI established the Countering Violent Extremism (CVE) Office in 2012. This office leverages FBI resources and works with federal counterparts to empower local partners to prevent violent extremists and their supporters from inspiring, radicalizing, financing, or recruiting individuals or groups in the United States to commit acts of violence. The CVE Office facilitates an understanding of the catalysts to violent extremism, its behavioral components, and radicalization factors and identifies possible inhibitors to these phenomena. The FBI is leading efforts to conduct outreach and raise community awareness while upholding civil rights and liberties. 12 U.S. Department of Homeland Security, http://www.dhs.gov (accessed August 11, 2014). 13 FBI Deputy Director Mark F. Giuliano. 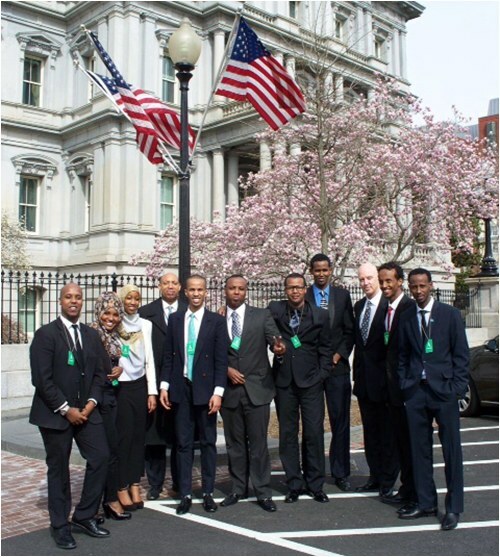 14 The White House, “Empowering Local Partners to Prevent Violent Extremism in the United States,” http://www.whitehouse.gov/sites/default/files/empowering_local_partners.pdf (accessed August 11, 2014); and “Strategic Implementation Plan for Empowering Local Partners to Prevent Violent Extremism in the United States,” http://www.whitehouse.gov/sites/default/files/sip-final.pdf (accessed August 11, 2014). 15 The White House, “National Security Council,” http://www.whitehouse.gov/administration/eop/ nsc (accessed August 13, 2014). 16 U.S. Department of Justice, http://www.doj.gov (accessed August 11, 2014); and Office of the Director of National Intelligence, National Counterterrorism Center, http://www.nctc.gov (accessed August 11, 2014). 17 U.S. Department of Defense, DOD White Paper on Countering Violent Extremism—Scientific Methods and Strategies, 2011; and Clark McCauley, National Consortium for Study of Terrorism and Responses to Terrorism (START), Models and Mechanisms of Group Radicalization (2001). 18 Statement of FBI Director James B. Comey before the U.S. House of Representatives Committee on the Judiciary, June 11, 2014. 19 CVEO Supervisory Intelligence Analyst Tracy Miller. 20 Foreign Operations Specialist Megan L. McLaren of the FBI’s International Operations Division. 21 CVEO Supervisory Intelligence Analyst Tracy Miller. 23 Chief Gregory Ehrie of the FBI’s Domestic Terrorism Operations Section. 24 Statement of FBI Director James B. Comey before the U.S. House of Representatives Committee on the Judiciary, June 11, 2014.